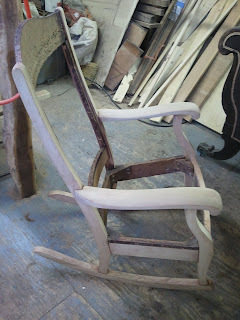 Recently I restored a rocking chair made from Birch with Mahogany veneer in a few places. 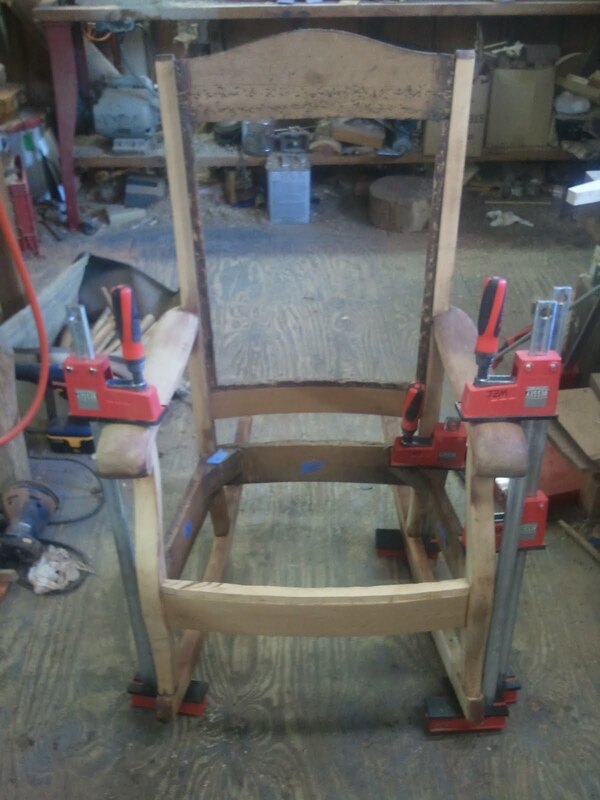 The rocker had a broken rocker as well as a host of other structural problems. 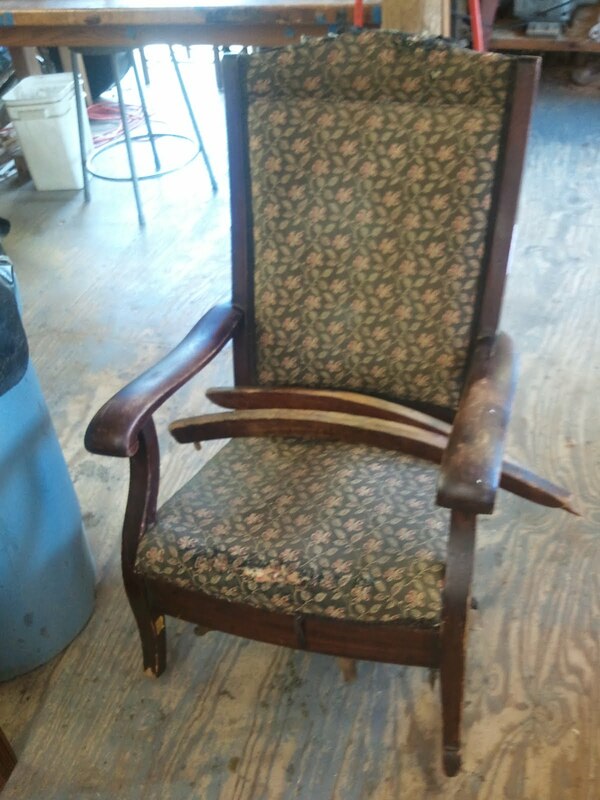 It also was in need of reupholstering and refinishing. 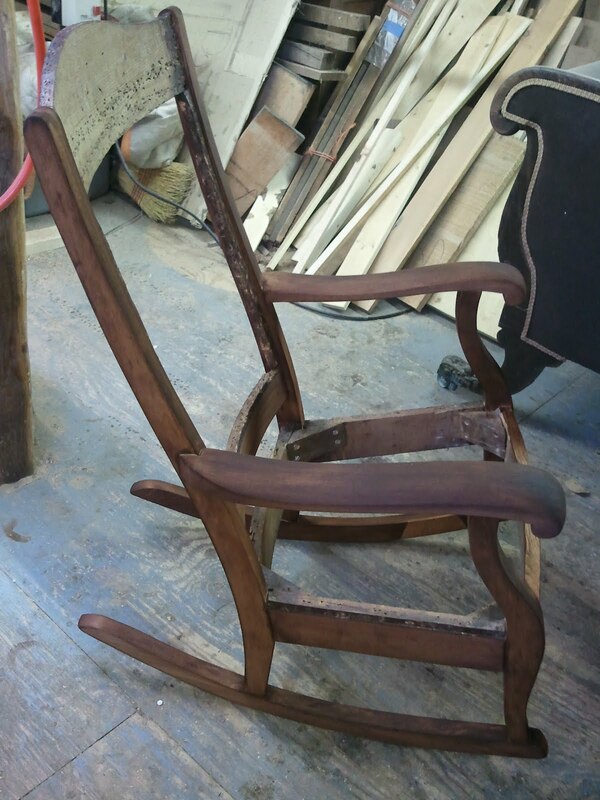 There was not much to find out about this chair in terms of its history, but judging by the style and the construction methods used, I would place it around 1930. It could easily have been made earlier or later. 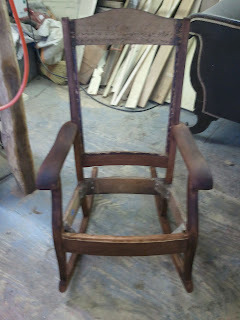 Below is a photo of the rocker in the condition it was when it entered my shop. 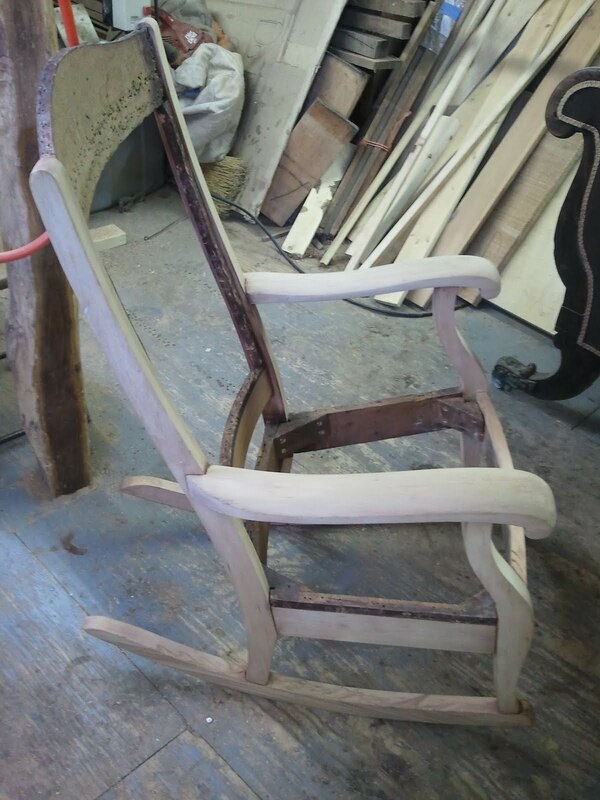 the rockers are laid across the seat. 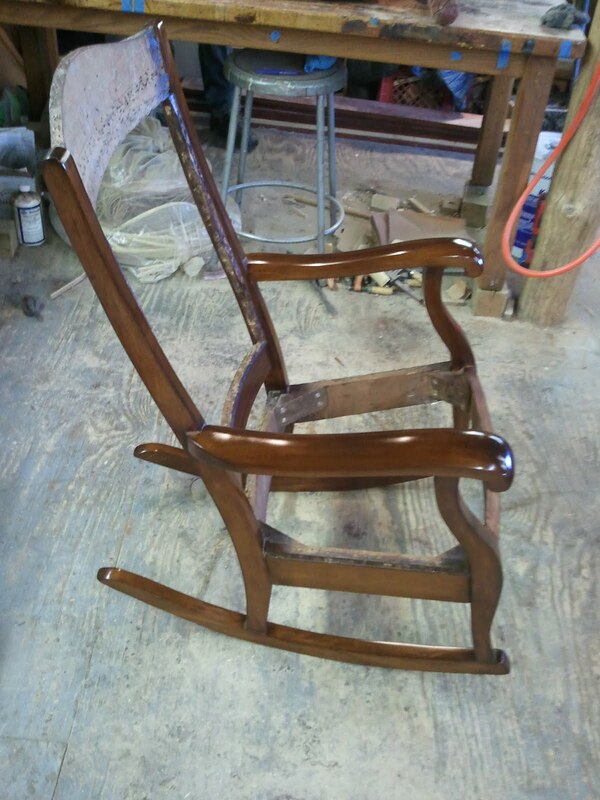 The finish was entirely removed from the chair and the next step was to make the repairs. 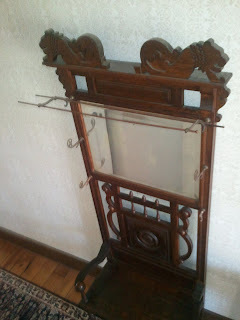 the next few photos show this. Patching a missing portion on the back of one of the legs. 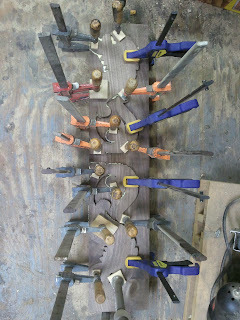 gluing down loose veneer on one the front seat stretcher. As I stated earlier, one of the rockers was broken. 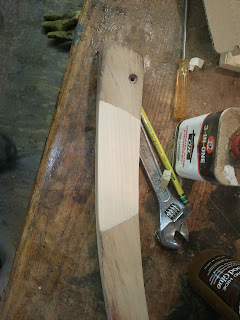 This was mended by making two bridging patches that spanned the break. These were inlaid in the rocker on both sides sandwiching the break with new wood. Below is a photo of one of the bridging patches. This next photo shows the stripped chair being glued up. 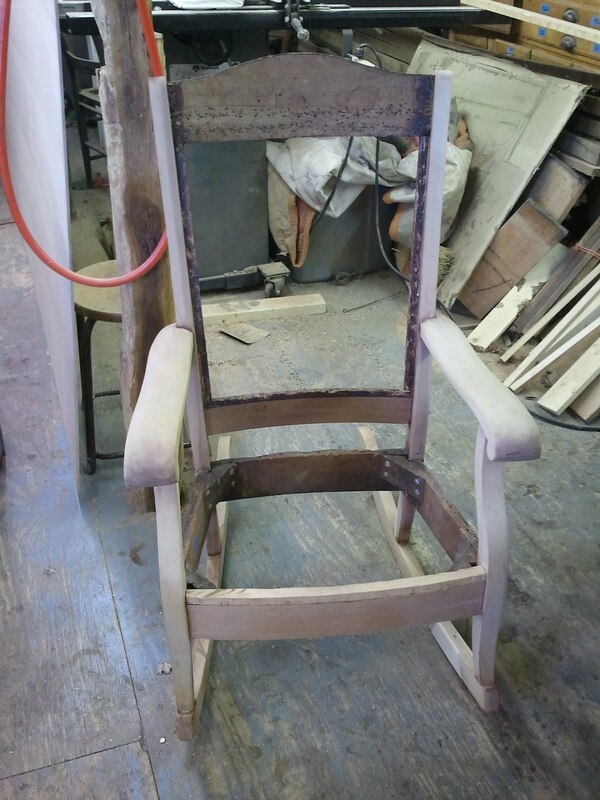 The chair sanded, glued, and ready for staining. These next two photos show the chair after the stain was applied. 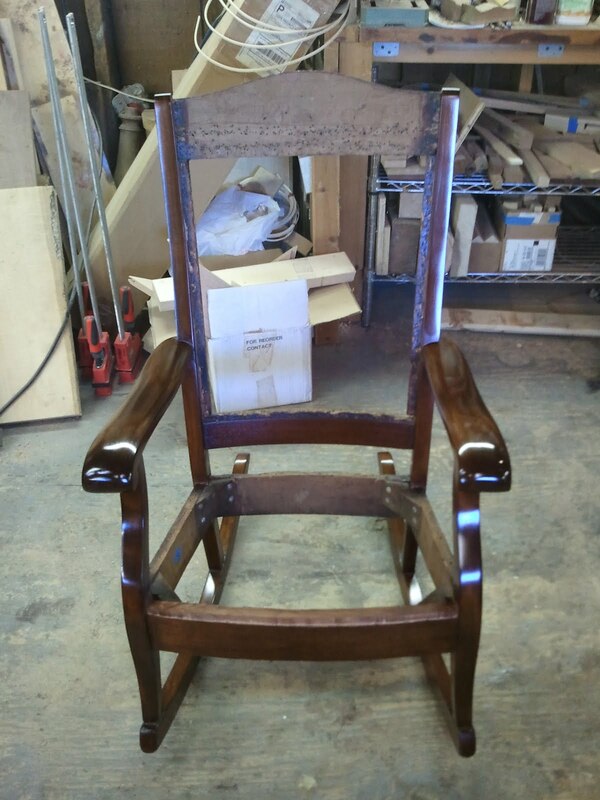 These photos show the chair after the finish was applied. 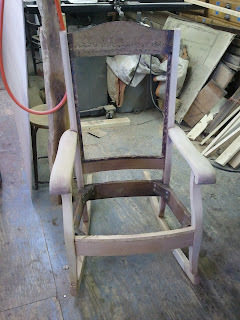 The last photo shows the chair with the new upholstery in place. 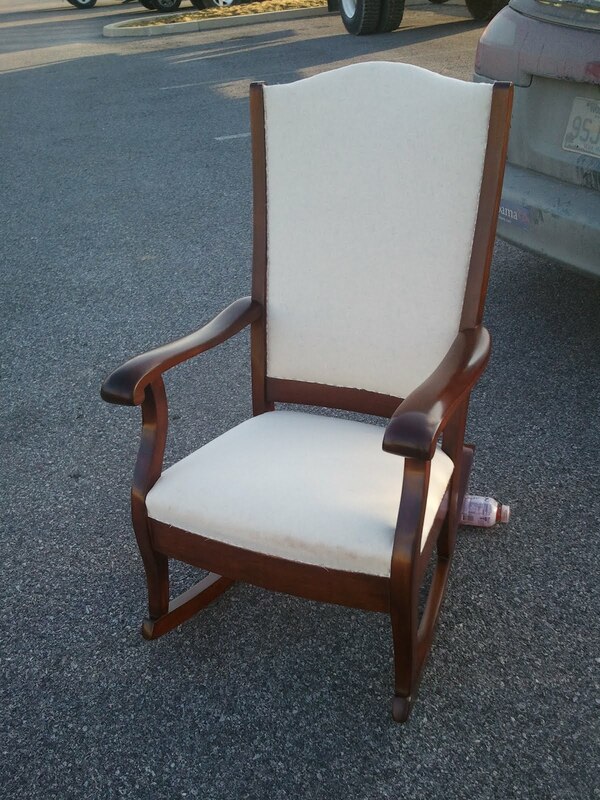 The customer wanted to choose and put the fabric on herself, so the upholsterer covered the upholstery with muslin which goes under the final fabric. The bottle under the rocker in the last photo was placed there to keep the rocker from shaking in the wind! Earlier this year I was commissioned by a customer to make a reproduction of an Oak hall tree for them to give as a gift to their son and his family. 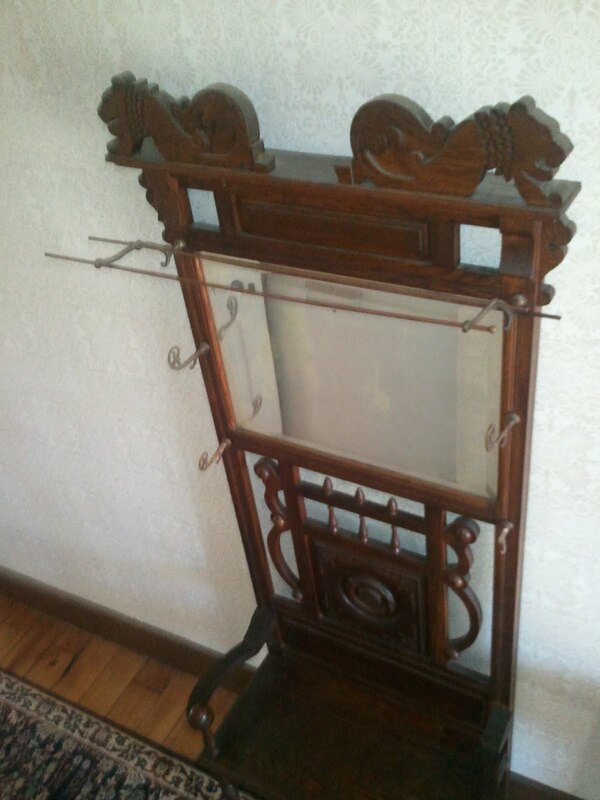 The original hall tree is in their family home and has been in the family since it was bought new. 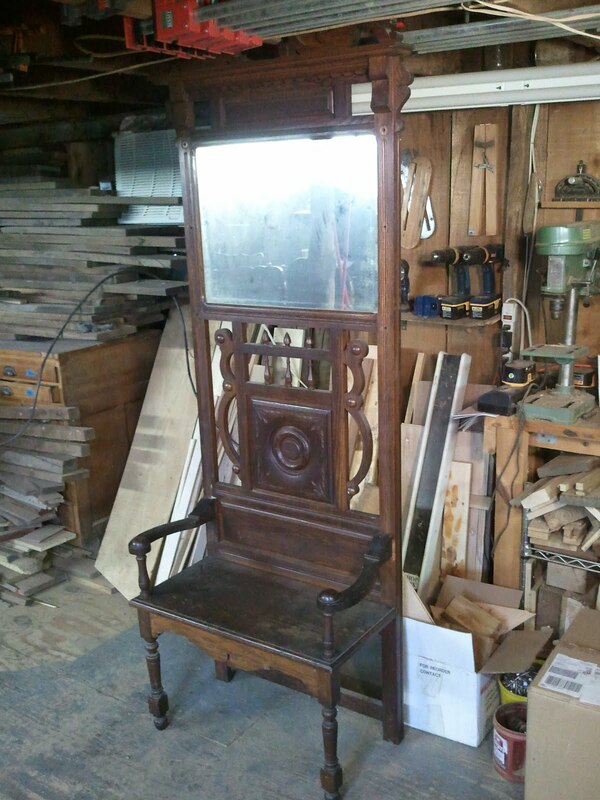 The piece comes from the Golden Oak period of furniture manufacturing and dates to around 1890. 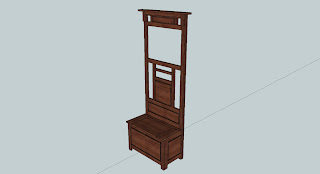 The style of the hall tree is loosely based on the designs of the Aesthetic Movement that was popular in America during the late 19th century and is often associated with the Eastlake style, although I would not go as far as to call this an Eastlake hall tree. 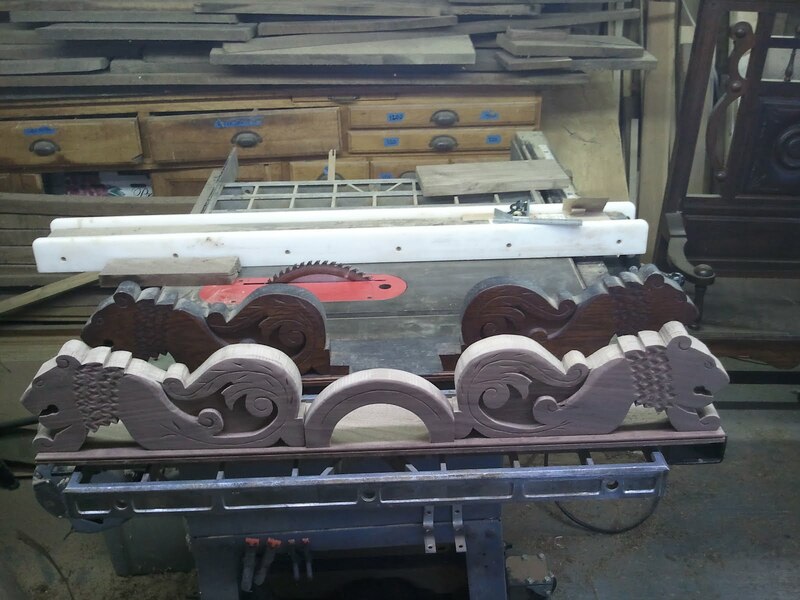 As I have written about in previous posts, this style of furniture lent itself to mass production very well, because of the use of shallow carving and straight shallow moldings, both easily replicated by machine. 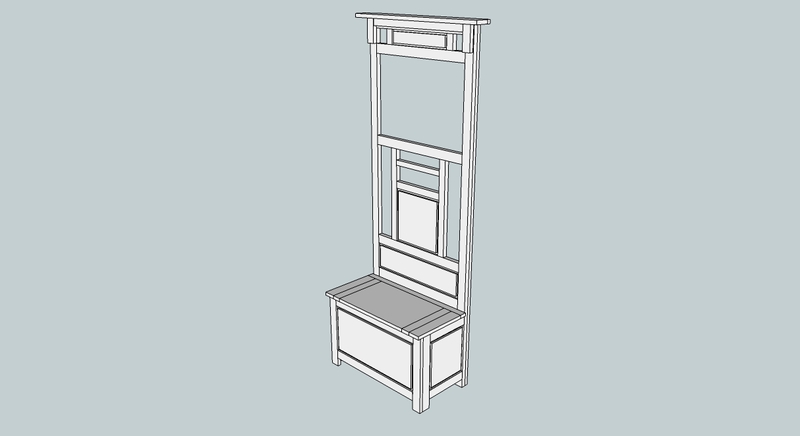 Because of this the designs varied greatly and took on a life and style of there own which moved away from the principles of the earlier movements. 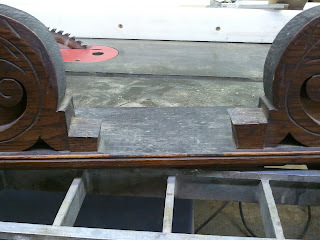 As we will see as the process moves along, even with the use of machines there is still a lot of handwork and also plenty of thought dedicated to machine set up, etc. While the original was made of Oak, the customer asked that I make the reproduction from Black Walnut bought by his uncle 50 years ago. 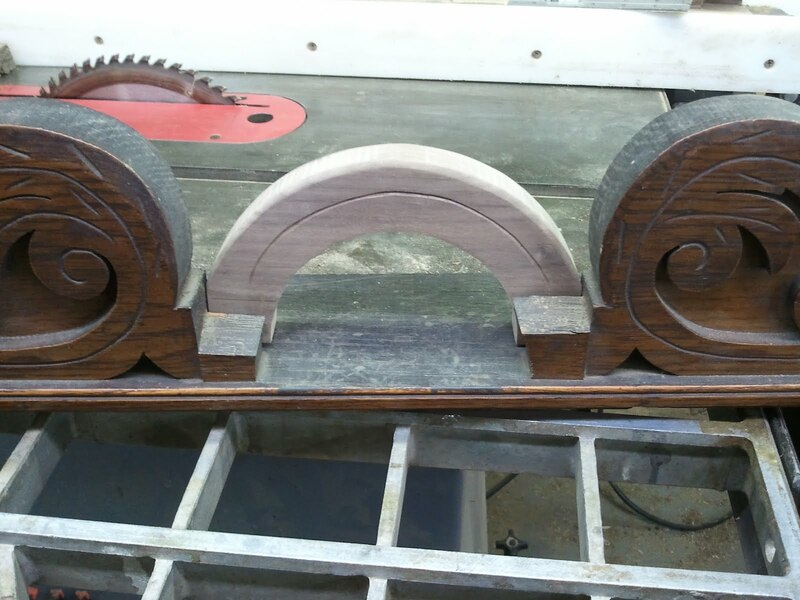 Walnut is a great choice for the project, and it was a wood favored by American craftsmen of the late 19th century. 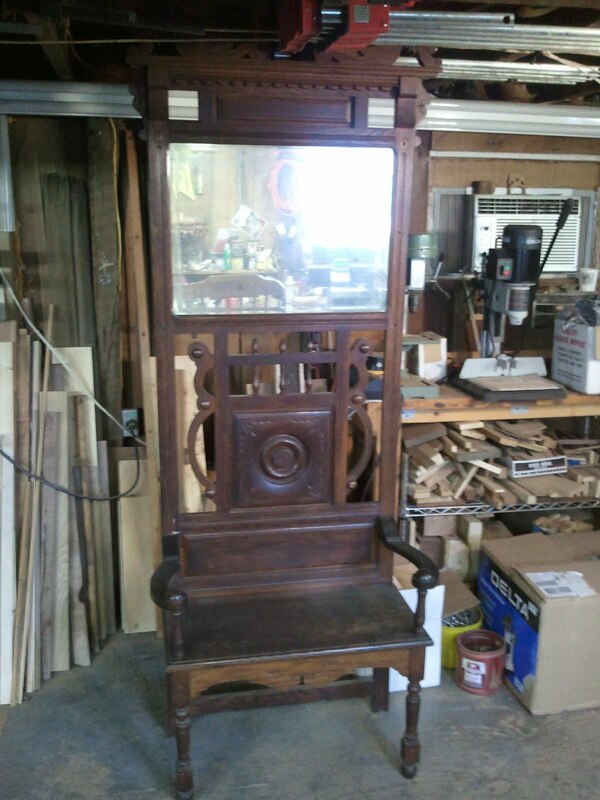 The only reason that the original hall tree was made of Oak and not Walnut was because by the time it was made, the American Walnut stores had been heavily depleted and the furniture makers of the 1890's switched to Red and White Oak due to it's availability. I will write several posts about this reproduction as the work progresses. 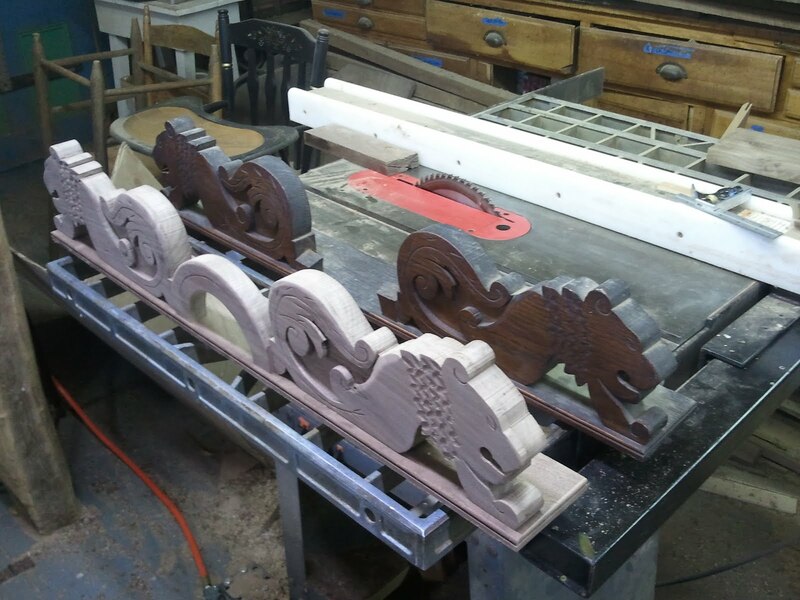 This first post is concerned with the design and design changes made to the reproduction as well as the initial work, which was the carving of the lion pediment. 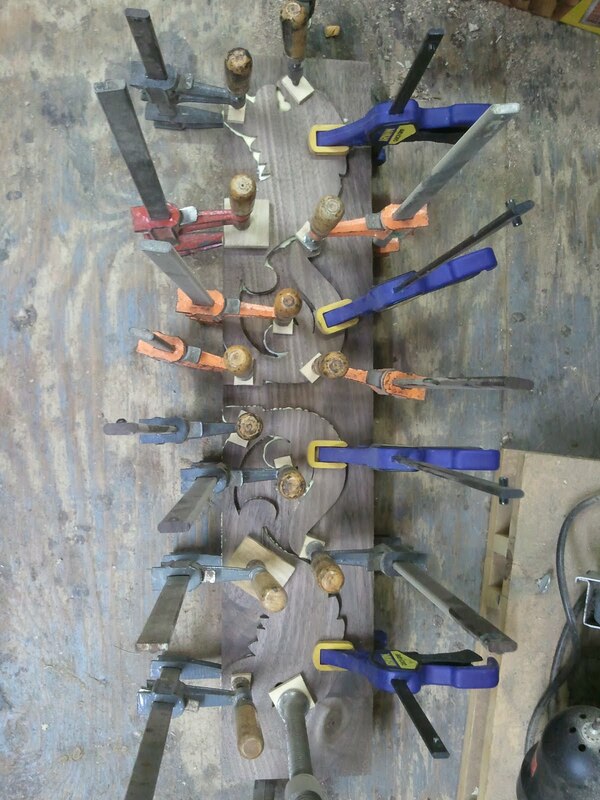 Below are a few photos of the Oak hall tree that I was asked to reproduce. 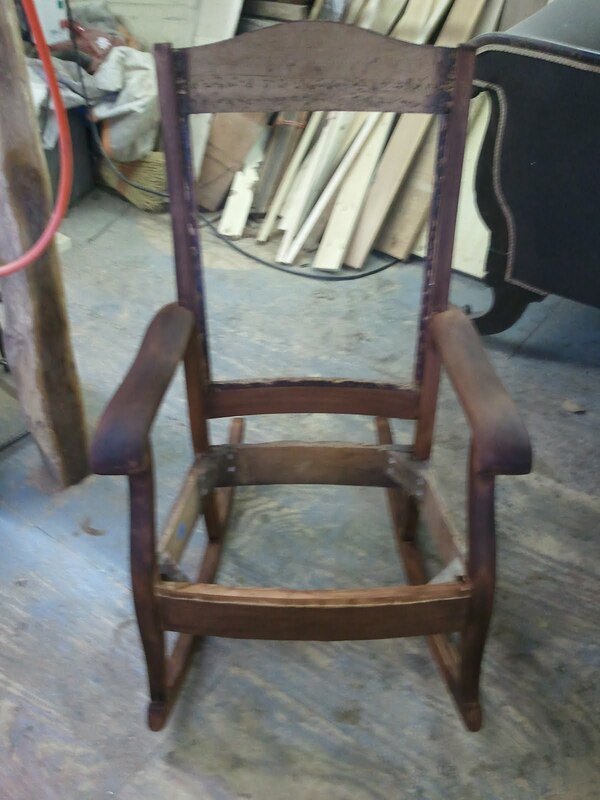 The customer asked that I make a few changes to the original. 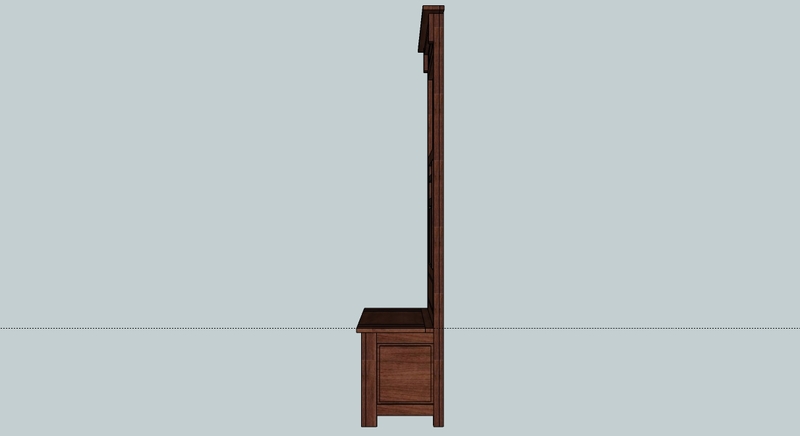 The biggest change was that they wanted to turn the area below the seat into an area for storage with a lid that lifts, like a small blanket chest with a hall tree back. 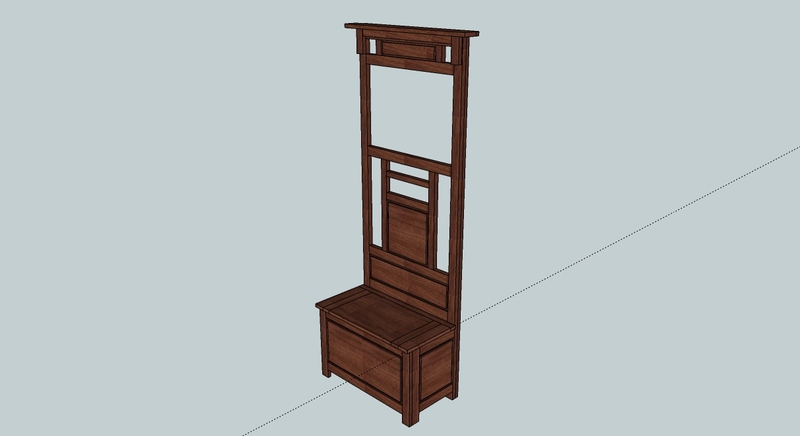 To illustrate this as well as to get a good sense of the joinery, I drew a model of the proposed hall tree in Google SketchUp. 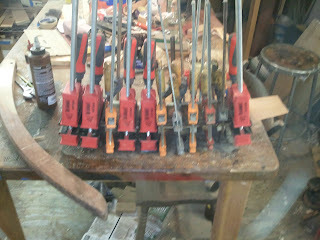 This allowed me to figure up a cut list and it gives the customer a sense of what the finished product will look like. 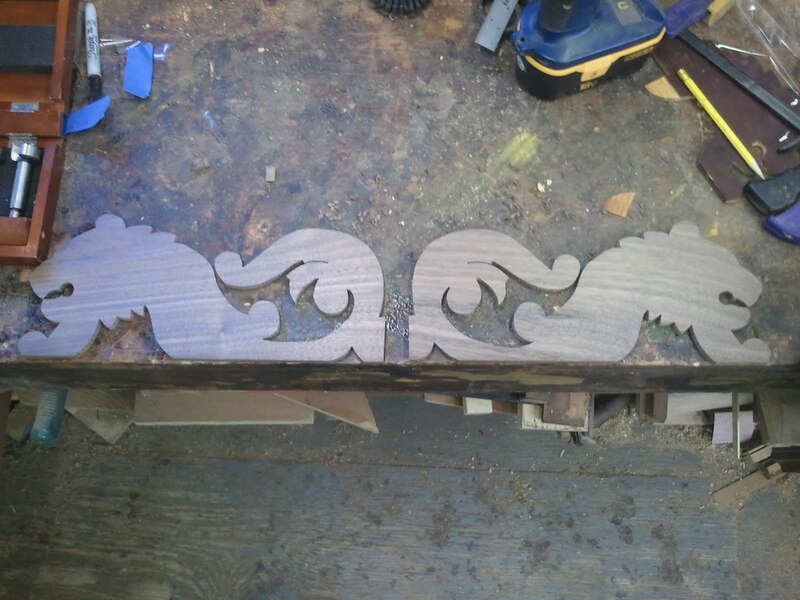 because I have the original to use as a template, I decided not to sketch the moldings, carvings, and turnings. 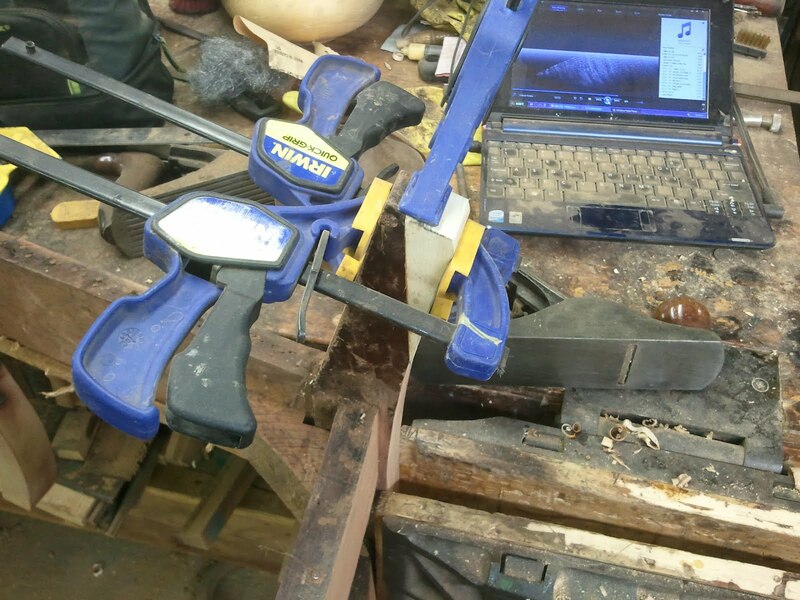 These can be copied directly from the original. 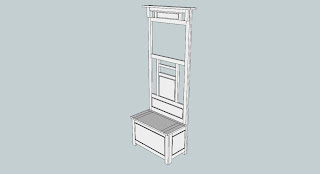 Below are several views of the SketchUp model first in white for clarity, and then "colored" with Walnut grain. 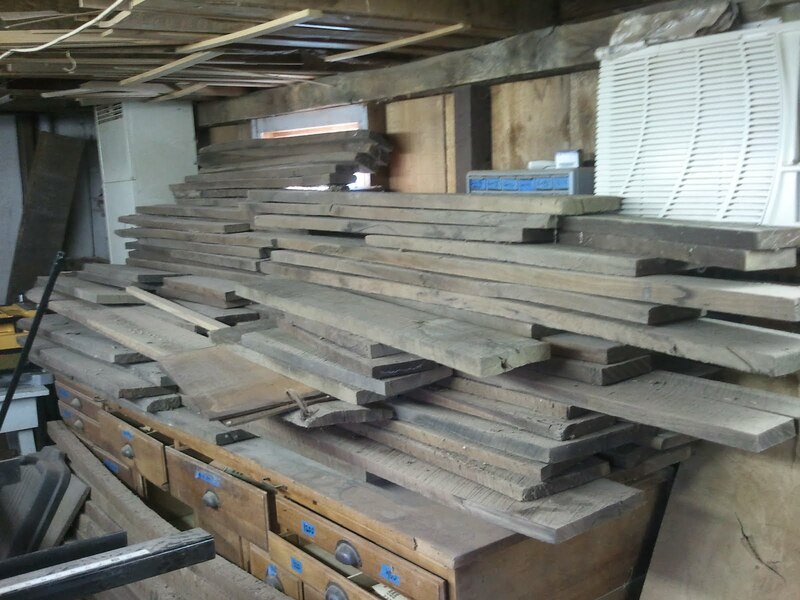 As I mentioned earlier, the customer supplied me with 50 year old Black Walnut to use for the project. 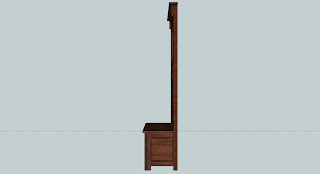 Below is a photo of the Walnut stack. 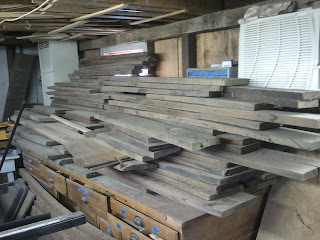 When this wood was milled, it weighed far less then a new board the same dimensions, due to it's low moisture content. 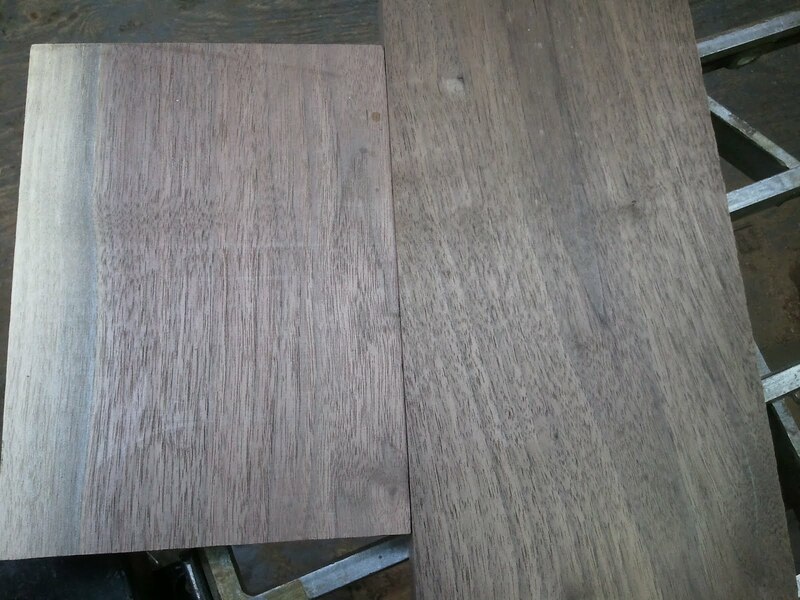 The color was also a bit darker. Below is a photo of a new board of Walnut (on the left) next to one of the older boards (on the right). 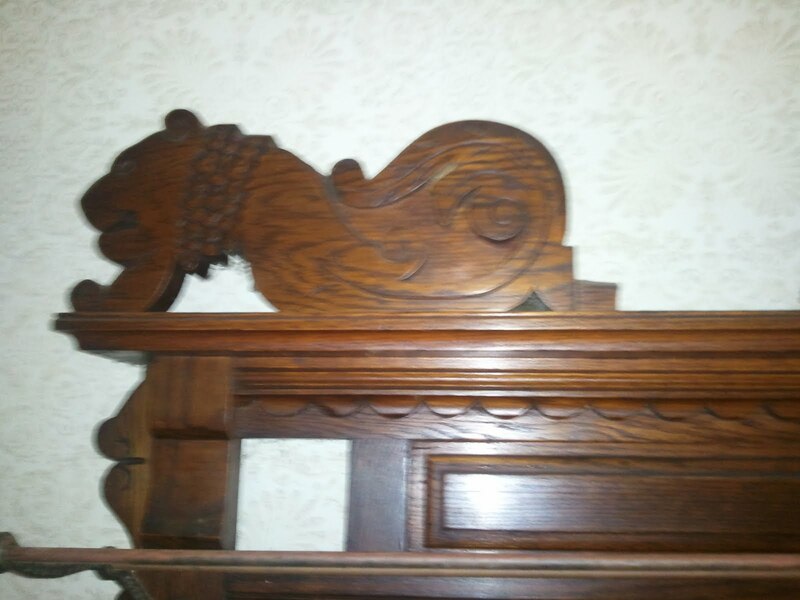 This post is concerned from here forward with the carving of the lion pediment that sits at the top of the hall tree. 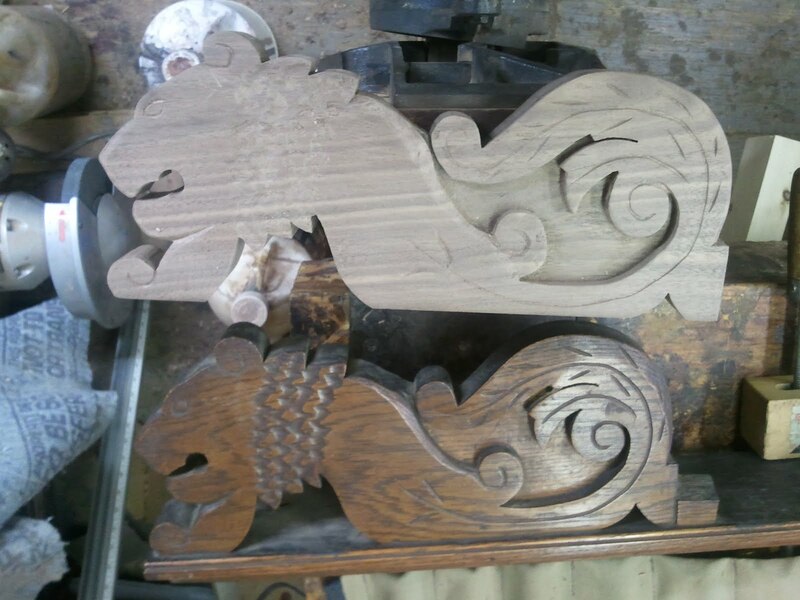 The lions and the top molding they sit on were removable which meant I could examine and work with this section individually (and I could stand the hall tree up in my shop!). 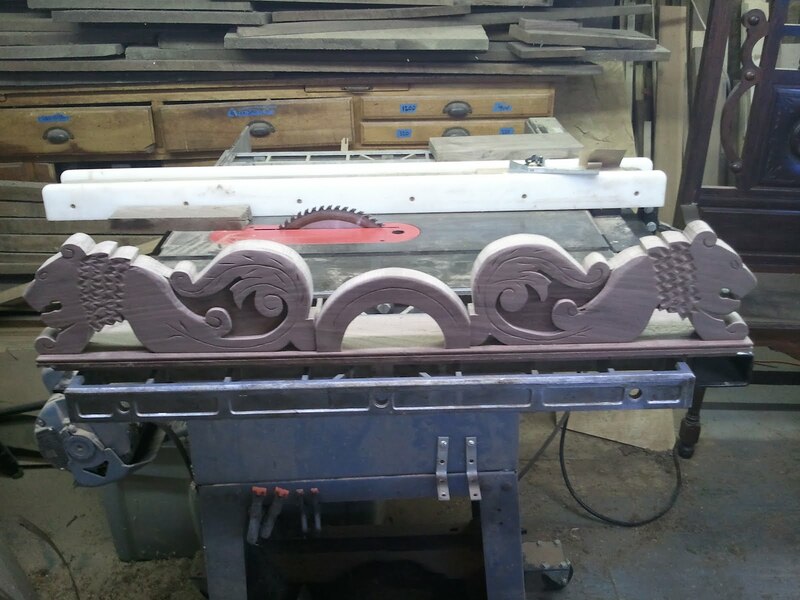 Below is a photo of one of the lions taken while the pediment was still attached. 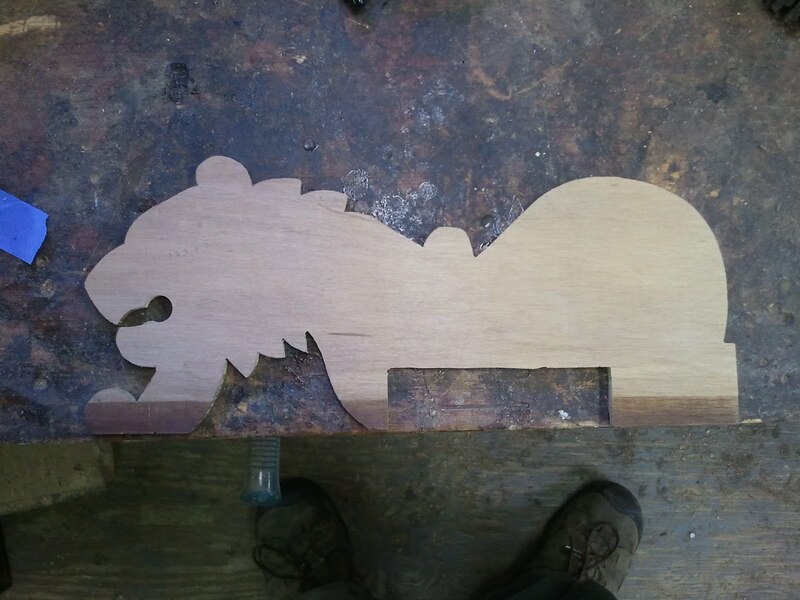 To copy the shape of the lions, I made a template that was traced directly from the original. 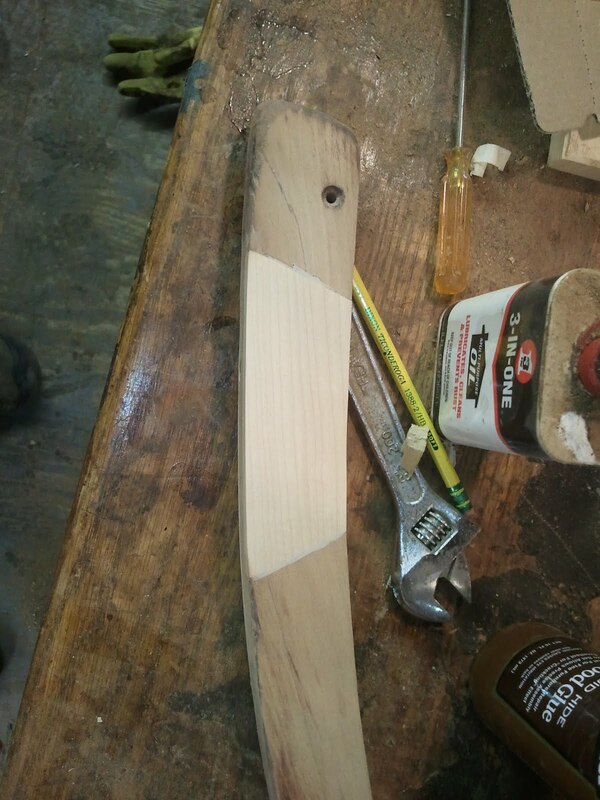 The photo below shows the template. 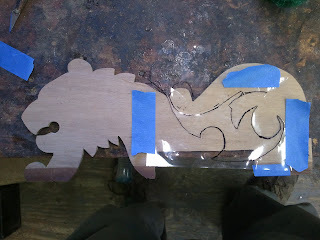 The large rectangle section that is cut out was made so I could put the template around a glue block that was in the way. 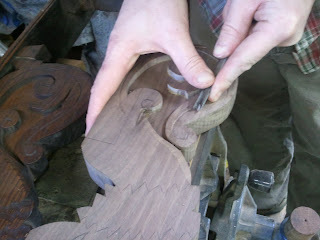 The next step was to get get the inside lines of the carving for the template. 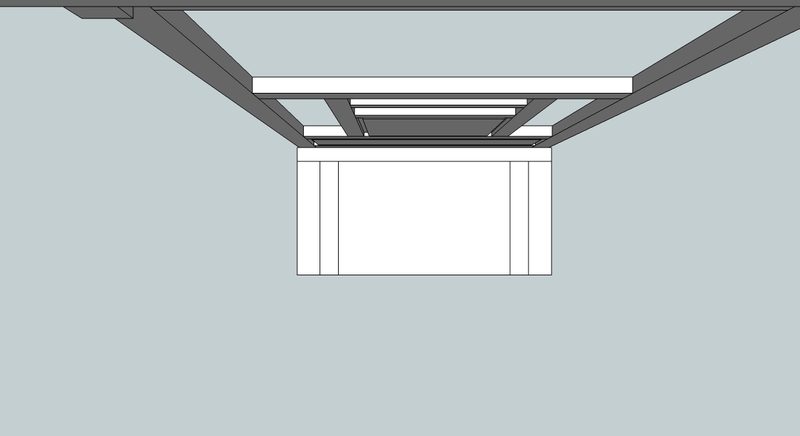 This was done by tracing the original with a transparency and transferring the lines to the template. The carving was made up of two boards glued together. 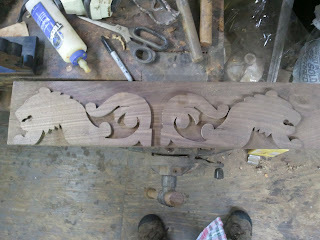 The first is about 1/4 " thick and took most of the carving. The second was a backer board around 3/4" thick. This was done so that the smaller board could be pierced using a band saw and applied to the backer, rather than removing material from the center by hand which was time consuming. 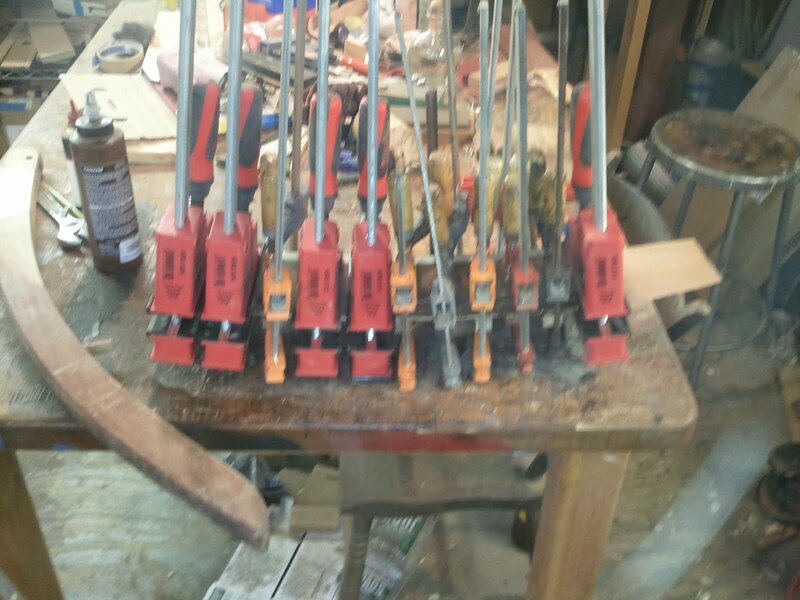 I made the duplicated in the same fashion. Below are the two lion 1/4" face boards cut out. 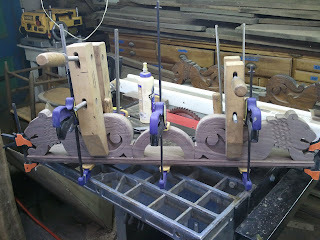 The next step was to attach them to the backing board. 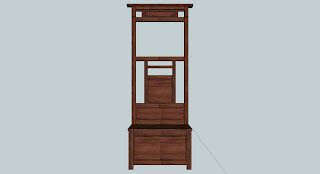 This is seen below. 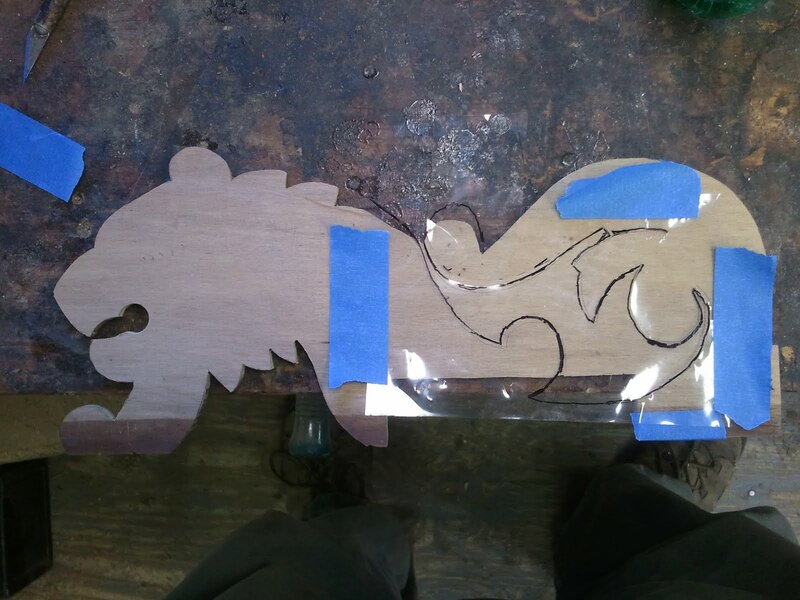 After the clamps were removed and the glue had dried, The lions were taken back to the bandsaw and cut out using the 1/4" boards as a guide. 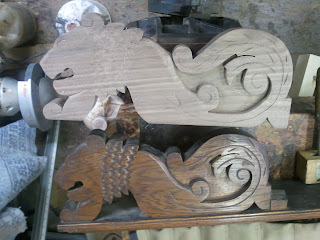 The next step was to carve the detail into the lions. Here are a few photos of me using a V-gouge to carve a line. 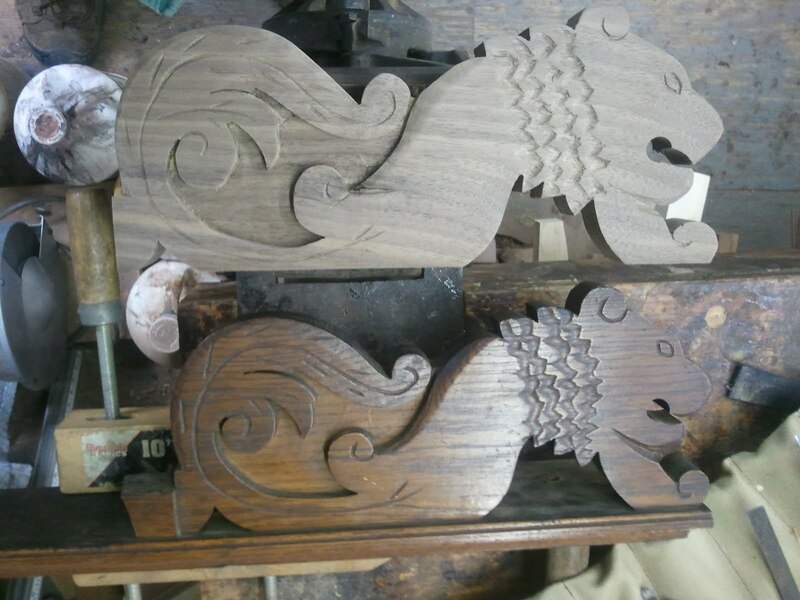 The next two photos show the lion carvings next to their original counterparts. 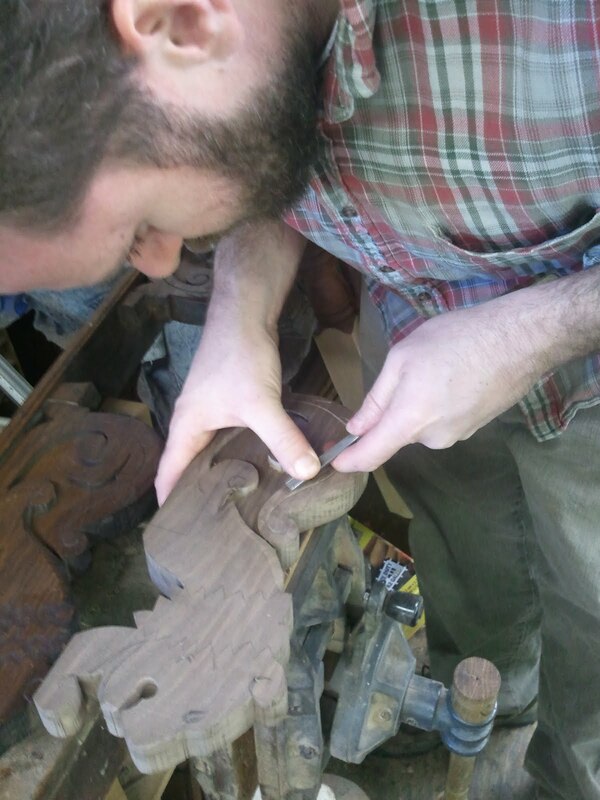 Between the lions was a missing piece of molding. After much research, I could not find a good indication of what was there. 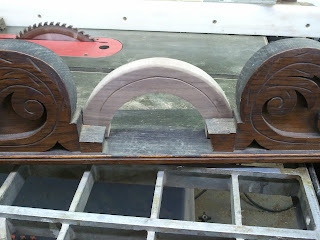 The bits of the original that were there suggested an arch, so I decided to go with this. I carved a line in the arch and softened the upper edge to pick up on the carving on the lions. The next photo shows the missing section followed by a photo of the arch in it's place on the original. 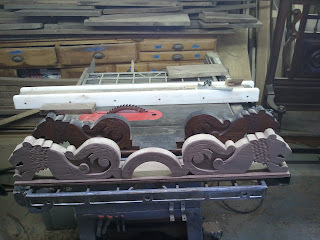 After the arch was made I made the molded board the lions are attached to and then glued the whole piece together. 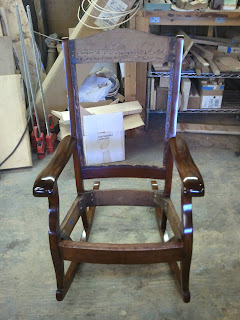 This is a photo of the finished product. The following photos show the original next to the new carving. I will post more on the manufacture of this hall tree as the work progresses.